Scout Mini 2 Liter Dragon (Pot Only)! Must have Scout accessory when cooking for 2 or more! Scout stove & accessories can store inside Mini Scout Dragon Pot for easy transportation. See listing above for entire kit. 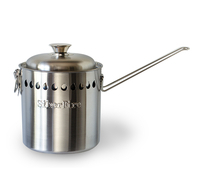 The SilverFire Stainless Steel Skirted Mini 2 Liter Dragon Pot is amazing for both wood fired stoves or your residential gas, butane, or propane cooktop. This may be the most efficient cook pot you have ever used! Our 2 liter (just under 1/2 gallon!) 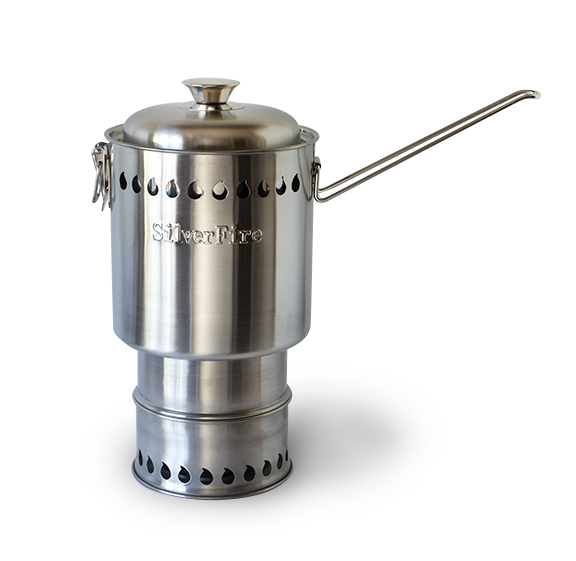 Dragon Pot is a must have Scout stove option to save fuel, and to reduce boiling times, fuel use, & emissions. As it would appear mounted on Scout Stove below, functioning as a Scout Stove windscreen, in addition to increasing heat transfer & efficiency. Already own other stoves? Our Mini Dragon 2 liter pot is going to provide a wind skirt, increase heat transfer, reduce fuel use, and reduce boiling times with any stove with open flame that accepts our 4 & 7/8" wide inner diameter bottom (copy wood gas Scout stoves, BioLite Base Camp model only, Most Solo Models, Alcohol Stoves, Gas stoves, MSR, etc...). The Scout 2 liter Mini Dragon Pot is going to maximize most other trekking stoves available, reducing fuel costs, time to boil, and serve as a windscreen. No need to pack windscreen! The Mini-Dragon Pot is 6 & 1/2" / 16.51 cm tall and 6 & 1/2" / 16.51 cm wide (not including locking handle bail or lid). The Mini Dragon Pot lid travels inverted with locking handle bail latched. The exterior pot base diameter (OD) is 6 & 1/4" / 15.875 cm and the ID is 4 & 7/8" / 12.38 cm (this is the important limiting diameter to check for compatibility using other biomass, gas, or multi-fuel stoves, to verify pot to specific stove model fit). The pot handle bail latched is 6 & 7/8" / 17.46 cm at tallest point. The handle bail is 6 & 5/8" / folded and secured across top of pot (width). The Mini Dragon Pot is 8 & 1/8" / 20.64 cm tall, when lid in place cooking. It will provide just under 2 liters of emergency drinking water , quickly boil large volumes of pasta or noodle water, prepare steamed foods, or provide an adequate volume of heated water to sanitize your cookware. 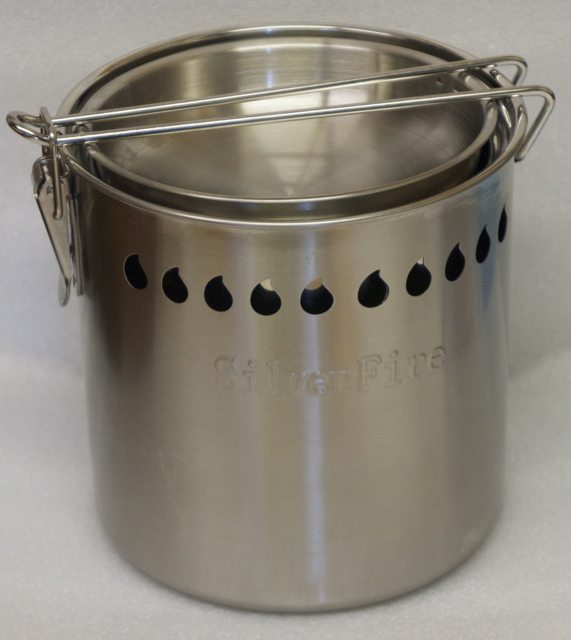 This 2 liter skirted pot is a much more efficient option than a pot skirts, increasing heat transfer and due to the unique design serves as a wind skirt for the Scout Stove. It also increases safety, not allowing the pot to slide off stove when stirred. Shown below with optional Scout stove.